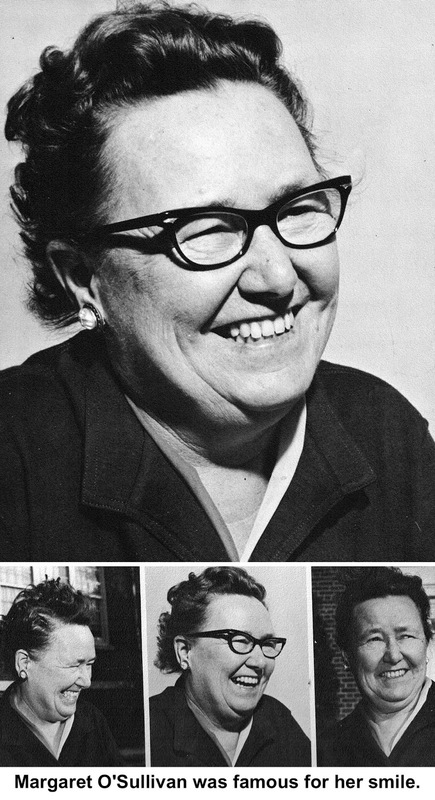 In 1965, the senior class at Ridgefield High School dedicated its yearbook to Margaret O’Sullivan who, by then, was a guidance counselor at the school. Few students at the time knew of the role “Miss O” played in helping young women be a part of interscholastic athletics. “Before girls sports at Ridgefield High School received an equality boost from Title IX legislation in the early 1970s, they got a formative hand from Margaret O’Sullivan some 30 years earlier,” said longtime Ridgefield Press sports editor Tim Murphy. Margaret Claire O’Sullivan was born in 1911 in South Boston, Mass., and graduated from Boston University with a degree in physical education. She later earned a master’s degree at the University of Bridgeport. When she joined the high school faculty as a physical education teacher in 1943, there were no interscholastic girls sports teams at RHS. Not one. O’Sullivan quickly changed that, organizing varsity and junior varsity girls teams for one sport each season: field hockey in the fall, basketball in the winter, and softball in the spring. She later started a club team for girls tennis. While turnout for the programs was good, conditions were not. The girls had limited equipment and shared fields with boys’ sports teams — mostly, they practiced and played when the boys were at away games. But O’Sullivan always fought for more time and attention to girls’ athletics and well-being. She served as head of the girls physical education department at the high school until 1962, when she became a guidance counselor. O’Sullivan retired in 1973 and moved to Shrewsbury, Mass., to live with a sister. When she died in 1993 at the age of 81, she had been all but forgotten locally. The Ridgefield Press had only a brief, three-paragraph obituary, provided by the sister (but did run a picture of her, smiling).